A panorex x-ray provides a full view of the upper and lower jaws, teeth, temporomandibular joints, and sinuses. It clearly shows impacted teeth or other intrabony abnormalities, and surrounding anatomy. 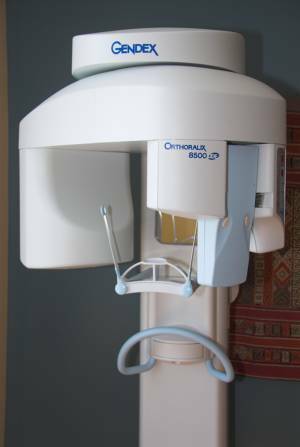 Panorex x-rays are often used to examine for wisdom teeth. This type of x-ray can show the relationship of the developing tooth roots to the mandibular nerve and maxillary sinus cavities. Digital x-rays can now be taken using sensors that transmit the image directly onto a computer monitor. An important advantage to this new technology is that it reduces the amount of radiation by approximately 90%. 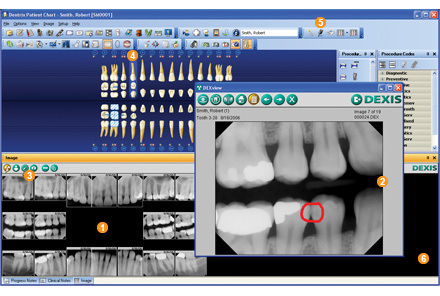 Digital x-rays are faster and are environmentally friendly. Our intraoral camera uses a tiny fiber-optic want to easily take vivid photographs of the inside of your mouth. This allows you to see what we see, and gain a better understanding of your health. Our treatment rooms are equipped with state-of-the-art patient-education video systems. If you would like more information about a particular procedure, we would be happy to play that video segment for you. 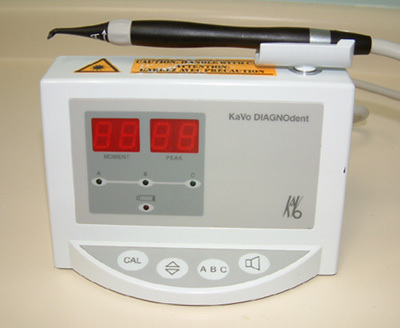 The Cadent iTero uses new technology to give you the most comfortable experience possible during your dental restoration process. With the iTero, you dont need to have any of the dreaded goop put in your mouth, thus no gagging or bad after taste. Guided by voice prompts from the computer, several scans of the area being treated are taken with a hand-held wand. 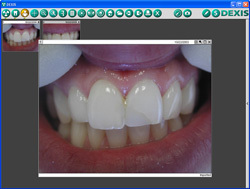 The iTero system allows more precise impressions and minimizes the need for remakes. 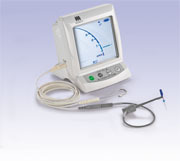 The ultrasonic scaler is a state of the art instrument that has proven to be effective in removing tarter from both above and below the gum line. 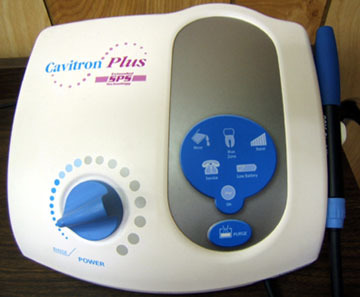 The gentle vibrations are an effective tool for deep cleaning and gum therapy. 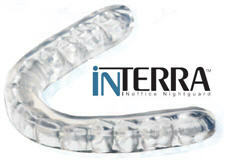 iNterra in-office nightguard is a nightguard material combined with an impressionless technique design for fabrication of resilient nightguard/splints directly in the oral cavity. The visible light cured resin material is adapted to the teeth and the occlusal contacts are generated directly in the mouth. The nightguard is completed and delivered in a single office visit. Isolite is the revolutionary dental device that is improving dentistry. Thousands of practices are embracing this innovative technology. Isolite is the only dental device that delivers continuous illumination, aspiration and retraction all in one easy-to-use, time-saving device that makes isolation easy and provides uninterrupted access to the patient. Isolite helps a dentist work easier, brighter and drier. 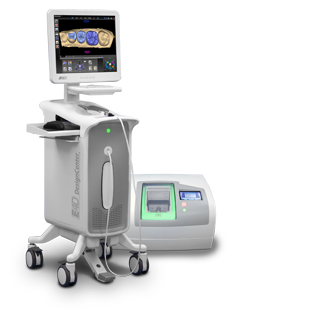 The Root ZX has set the industry standard for accuracy and patient safety. Invented in 1992, it was the first unit with the ability to work in wet canals - measurement is not affected by the presence or absence of fluids or electrolytes. Root ZX features patented technology which offers an accuracy rate of 97.5%. User friendly, its display screen is large and easy to read. The action of the meter in the display corresponds exactly to the tactile sensation of using the file. E4D's high-speed laser makes a digital impression of the preparation adn proximal teeth to creat an interactive 3D image. The laser technology captures images from multiple angles for fast, easy and accurate scanning. The software builds a library of images that wraps around a precise virtual model in seconds. The 3D image shows the actual dentition to recreate the exact oral environment in minimal time allowing the crowns to be fabricated and delivered the same day. 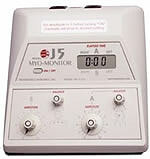 The J5 Myomonitor TENS unit is the latest in a succession of Myotronics products with a history of over 35 years of clinical effectiveness. It is known that cervical muscles play a significant role in head posture and consequently may impact occlusion. For years many dentist have stimulated these cervical muscles to relax them as part of the overall diagnosis and treatment process. 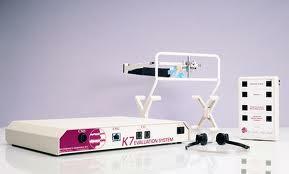 The K7 Evaluation System provides the dental clinician or researcher with three technologies for measuring, displaying and storing objective data on physiologic and anatomical status and function: Jaw tracking, electromyography and joint somography. This objective date enhances the doctor's diagnostic and treatment considerations with information not previously available.